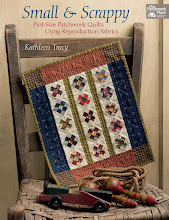 It's National Quilting Day! Let's celebrate. 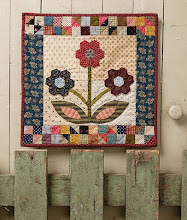 Sew along with me and make this cute little mug quilt. You know I love making small projects and sometimes it's just the thing to get my creativity going. This little pinwheel block is left over from a different project (still unfinished, ugh.) and I decided to use it to make a mug quilt. Isn't it sweet? A mug quilt is something I'll always use and it's always nice to have a few extra lying around just in case. What fun to serve someone a cup of tea with a cute mug rug and see them smile and say "Oh, how cute!" I am calling this "Whirlwind" because that's the name of the block and also my sewing room right now looks like a tornado hit it because I'm working on many things at once. I know most of you know exactly what I mean . . . .
1. Sew the pink and checked triangles together as shown. Make four units like this. 2. Sew each pink and checked unit together with a dark blue triangle. They finished units should measure 2 1/2". Make four. 3. Sew the four units together as shown, two at a time. Then, sew the two rows together, pinning the center as you stitch to make sure your points meet. Your block should measure 4 1/2". 4. Add the light print triangles to the sides of the block. 5. Sew the medium blue strips to the sides of your block. 6. Layer the quilt top with batting and backing and then add the pink binding. I like to use a 1 1/4" single-fold binding strip in my little quilts to avoid too much bulk. 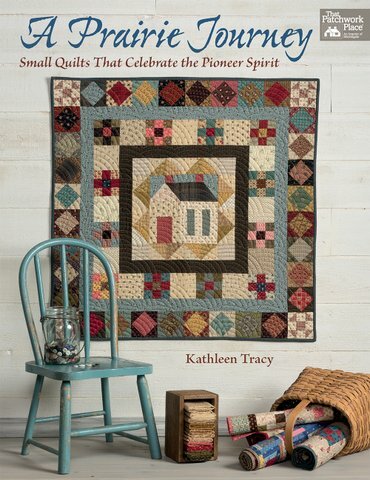 There are all sorts of fun ways to honor your quilty self today - visit a quilt shop, teach someone to quilt, finish a UFO, organize your scraps. You get the idea. 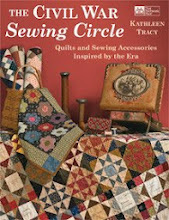 Hope whatever you do today involves at least a little bit of quilting. Happy St Patrick's Day too!